Posts tagged "contemporary bone reading"
The Mystic Dream has been mentioned here previously as a source for bone reading sets, though they don’t carry them anymore. They have now developed a casting cloth that can be used for bone readings, and a casting kit that contains five pieces and a different cloth. Either cloth could be used for bone reading. Should you decide later on to read without cloth markers, the black crushed velvet back would still be useful as a bone reading surface. The Heaven Above and Hell Below Casting Cloth has the center clearly marked and visual aids to help the reader mark clear quadrants if you use a reading approach that makes use of them, such as the four elements, or the four seasons. The past and future areas are also marked, and while the reader probably doesn’t need those references marked, it makes things interesting for the client. A suggested meaning for the upper and lower halves of the cloth are given in the description online, but you are obviously free to assign any meanings you would like. The cloth measures 18 1/2″ X 18 1/2″. The Black Forest Casting Kit has a different cloth reading design, though the format and style are similar. It comes with five pieces to cast, and instructions on their use. They can be used alone or as the foundation pieces for a larger bone set. The cloth is the same size as the Heaven Above, and Hell Below Casting Cloth, and it has the same crushed velvet back. The Mystic Dream also offers bone reading classes so I would not be surprised to see a class on the Black Forest Casting Set, or a bone reading class using their new casting cloth. Either cloth would be a nice addition to a bone reader’s toolkit. The size might be constraining for large sets, say 40 plus pieces, but even if your set is large, these cloths would be great for those times that you just want to throw a quick handful of bones. Using an attractive cloth enhances the visual allure of bone reading and helps to set an atmosphere. Both cloths are available from The Mystic Dream Website or from their brick and mortar shop. Raven Whitehorse is a bone reader, and author. She was one of the first bone readers I met when I was just starting out, and we have swapped readings. Her book: Stones, Bones, and Totems describes her system, and she has created a divination deck based on her bone set as well. How did you get started in bone reading? Tarot in the beginning made no connections for me and I never really used it much. I had a client once who became a teacher for a while and she told me I needed to find my own divination tool that would work for me. It stems from that day. How long have you been reading bones? I have been reading my set for 35 some odd years. I would not say it’s a traditional set. It revolves around me and my experiences and it is personalized to me. Did you have any teachers? I believe my father was the first to start prepping me. Things he said when I was a kid had a large influence on me and just stuck in my memories. 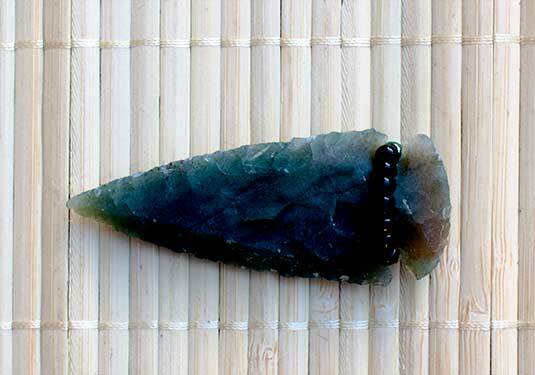 In my book I talk about the first piece I found – it was an arrowhead. When I showed it to my father he told me that I needed to always get straight to the point of things and to always shoot straight. I remember this day very well. I was 5 years old. I did not have another reading teacher. It just flows out of my mouth sometimes and I can’t stop it, lol. I did have a teacher who told me once that I really needed to find my divination system since at the time tarot and other forms were not speaking to me. She was a big influence to me in earlier years. This system I use has never been taught to me, it just comes from out of my head. It has only been in recent years that I have discovered that other people read in forms like this. Where did you get your bone pieces? I have been collecting them over the years. They have come at different times from different places and usually there is a lesson behind them in some form. My set is always changing and I am always learning with it. When a piece came to me in earlier years I always put it in a basket because there was a lesson I learned with it and I wanted to keep it separate from other *medicine* I had around. I did not realize why till years later. One day that just became my set. The wheel I read on came from a dream I had of speaking to my elders and it took off from there. How many bones in your set? How long did it take you to put your set together? Oh hums, I don’t know if my set will ever be totally together. New pieces come and go, and old pieces sometimes leave at their whim. But I will say it was a few years before I realized why I was collecting these things. Are you still adding pieces? Do you use a special cloth, or reading surface? Yes I do. It is styled after the Native American Medicine wheel, and it is leather. I made it after I was told why I was collecting all these little pieces of this and that, and what it was for was revealed after I made it. Did you do any consecration ceremony for them? Oh yes I do in fact, and I ask their permission to be added to the set, and to help me. 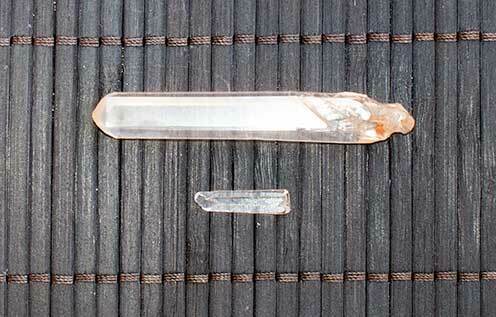 I do cleanse them with sage, and citrine. There are extra pieces of that in my set for that very reason of cleansing, and there is a sweet grass braid in my basket that stays. In the beginning I do use salt on some depending on what it is. Sometimes they get buried in salt. 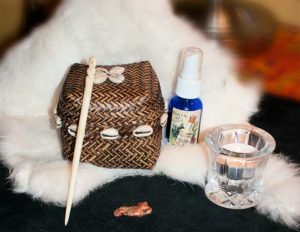 I’ll shake the basket in between readings to cleanse off the vibrations from the reading before if I am in a place where I can’t smudge. Shaking it works very well to knock the vibrations and energy off and get them ready for the next client. Do you do anything special before a reading – invocations, prayers, etc.? I do try to be quiet in my head, and ground and center, and I just simply ask them to show me with clarity. How do you think the bones work? I do believe that spirit and my ancestors are always present when the bones come out. It’s that whisper in my ear I get. However, in my experiences with my set personally it would seem that if the client is having similar problems certain pieces come out to talk so I do believe my ancestors and spirit talk back and forth with the clients spirits and ancestors to prompt me to say what needs to be heard. Do you throw all of your bones or some subset? My reading set sits in a basket. The person I am reading for reaches in, grabs a handful of things and drops them on the wheel, unless it’s a phone reading then I do it for them. But no they are not all thrown at once. They all would not be needed. Do you read for yourself? Some people feel that they do not do well reading for themselves. I have in the past read for myself and most everything in my set is a lesson I have learned at one time or the other. However I find a reading with other professionals gives a different insight to the questions I have at the time, or something I may be over looking that is part of the solution. A different point of view on the subject matter can be gained. Do you teach bone reading? I have done classes on what I do from time to time, and occasionally I take private students. What advice do you have for bone readers just starting out? Make sure the pieces feel correct for you and ask them if they will work with you before you add them to any set you plan to later use. Just because that is a coyote tooth and you need one doesn’t mean it will work for you. And just because you bless it and cleanse it don’t mean it will work in your set as well. Found this out first hand myself. I do read professionally sometimes at fairs or other public places, but I do not have a web page at this time. I have a Facebook page, and my personal profile. I do phone readings, Skype readings , email readings, chat readings, etc. My phone is listed on both Facebook pages, and sometimes luck has me in the same state as someone who wants a personal reading. I travel 365 days a year so you never know where I will be, or in what state. Stones, Bones, and Totems book is available in hardcover from the author. Contact her on her Facebook page, or at stonesbonestotems@gmail.com. The Kindle version is available on Amazon. Rings have a long history of being used as symbols of commitment. The wedding ring as a symbol of commitment to the one we love easily comes to mind. In my bone set I use the ring not only as a symbol of love and marriage, but as a symbol of any type of commitment. It could be a commitment to one’s studies, or to a job, or commitment to pursuing a dream. Of course, it can represent the commitment of marriage too, but that is a commitment that we seldom make, while our day to day lives are full of issues that could benefit from more, or even less commitment. A need for, or a need to commit? Unable or unwilling to commit? 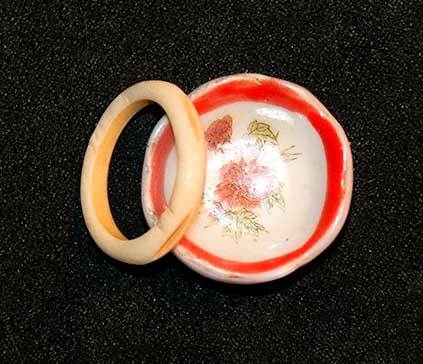 Most of us have one, or several rings that we don’t wear sitting in our jewelry boxes that could easily be spared for our bone set. Or you may prefer to get a ring that speaks to you specifically for that purpose. Although precious metal jewelry can be rather expensive, you can find suitable rings for next to nothing. 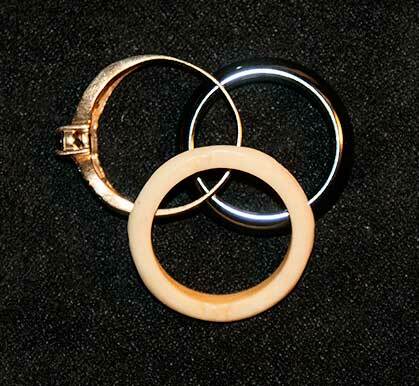 I used to use a gold ring that I no longer wore, but now I use a simple ring carved from bone in my travel set. It cost me the princely sum of $1.00. This is a piece that can also lend itself to more personal expression. Perhaps you have your grandmother’s wedding ring, or some other ring that holds special meaning for you. You can let it sit in your jewelry box and gather dust, or you can see if it would be a suitable addition to your bone set. P.S. I am currently attending school part time, and working on a project so I will be going to a bi-weekly update schedule until further notice. 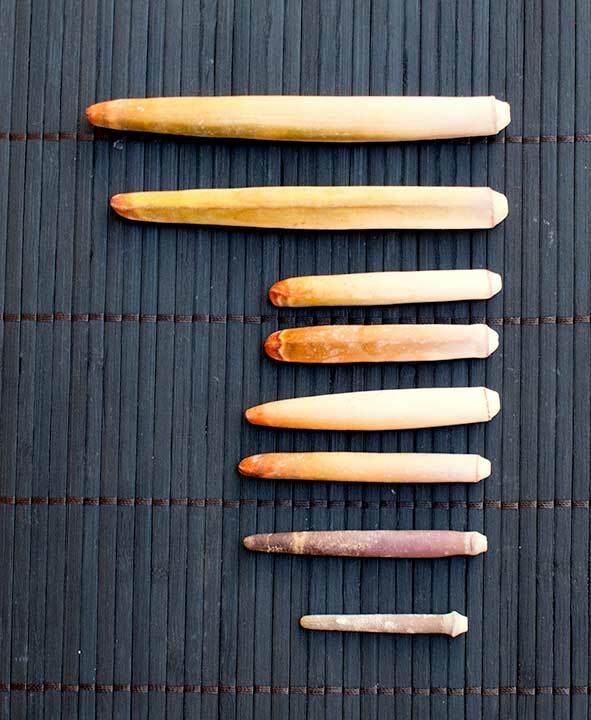 Hands of various types are readily available and can make an interesting addition to a bone set. I prefer hands where the two sides are easily distinguishable, but whether you need two sides or not depends on how you plan to interpret them. 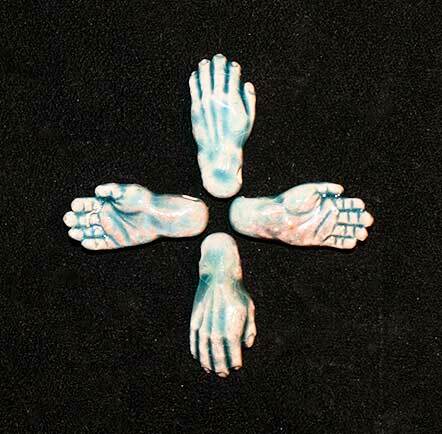 I have two hands in my set – the ceramic hand for material things, and the bone hand for spiritual things. I interpret the hand palm up as receiving. If the back of the hand is up then it is giving. You could also use a small hand to represent working with one’s hands, crafting, or creating, wanting, needing, requesting, helping, or donating. The position of the hand could also be interpreted – perhaps it looks like it is pushing something away, reaching for something, or holding something – even holding something down or up. 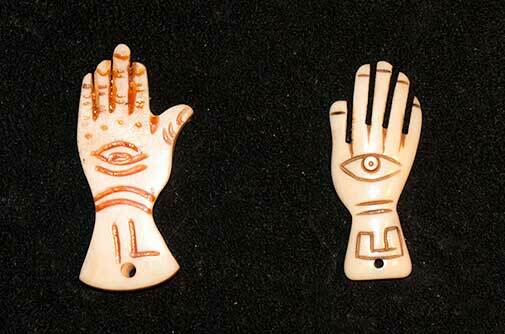 Hamsa Hands carved from Bone. You can get all types of hands online or in bead shops. Hamsa Hands, also called the Hand of Fatima, are used in many parts of the world as a symbol of protection, among other things. These stylized hands come in all sizes, colors and types of material. Smaller ones often meant to be worn as jewelry, or carried as good luck charms, are readily available and can be obtained quite inexpensively. If you want one with two different sides, check before you buy because many of them are the same on both sides. 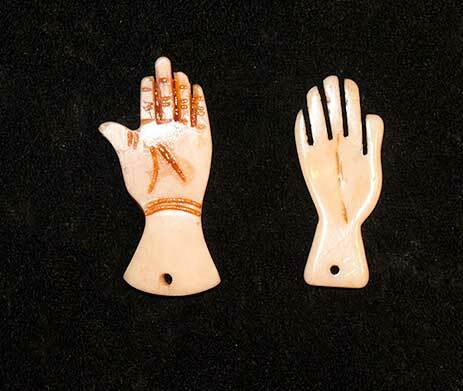 Ceramic and metal hands meant to be used as beads, charms, or pendants are also available, though they are not as common as Hamsa Hands. Likewise “Mano Cornutos,” and “Mano Ficos” can be used. Arms are included in some of the commercially available starter sets, and if the hand on the end is suitable, they can be used just like hands. Paws can be used for this as well. Various ceramic doll arms, a milagro arm, and a squirrel paw. Of course you could use something else altogether to represent these same ideas – anything with two distinct sides will work for these meanings, but if you come across a small, attractive, reasonably priced hand, you might want to give it a try. My eye is first drawn to the wishbone standing straight up being propped up by the piece for fear (skull and crossbones). Its hard to see in the photo, but the wishbone is standing straight up perpendicular to the skull and crossbones. I have never seen these two pieces interact this way, but my first thought was that there is potential for something here, but it is entangled in fear. Nearby is the piece for luck (whole nutmeg). If one can untangle the potential from their fear luck could be on their side. 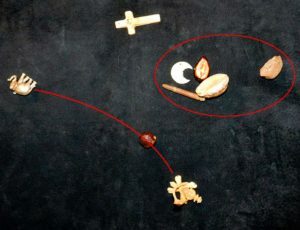 Next my eye was drawn to the group with the home (cowrie shell), an adult (purple cowrie shell), and something going on that is not visible (new moon). Something involving an adult is going on about, or near home, but it hasn’t become apparent yet. It is happening, just not visible. 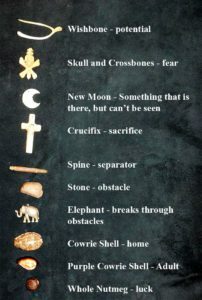 Nearby is the piece representing an obstacle (stone – on its side indicates it is not a huge obstacle), followed by sacrifice (crucifix face up), followed by the elephant that represents breaking through obstacles. So something is happening in, or near the home involving an adult. It is not visible to us, but it is happening none the less. Eventually it will come to light just as the new moon eventually becomes visible. There is an obstacle, requiring sacrifice, but we have the means to overcome it. There is potential for luck, but it is being held by fear – or there is potential for something being held by fear – breaking free could lead to luck. If this were my reading I would think about something I have wanted to do or try, but was fearful about. If I was dealing with something like that I might take a chance now and try it. Luck could be on my side. I would also think about what was going on around my home that involved someone else. If I am facing an obstacle in my life I now know that I can be victorious, but that it will not be easy and will require sacrifice. Note the separator – the home issue is separated from the issue involving potential and I would interpret them accordingly. The obstacle could be about the home issue, or an entirely different issue involving an obstacle. Perhaps your eye is drawn this way – untangling your potential from your fears leading to luck and a breakthrough. Perhaps you see the obstacle as part of the upper group, with sacrifice hanging over the entire throw. Or you may look at the original throw and come up with entirely different interpretations. Since this was only a handful of bones I assumed that all of them are relevant. You may decide differently. Your eye may be drawn to different things and in different directions. You may group things differently, or interpret these pieces together differently, and that is fine as long as it is consistent with your understanding of the bones. I hope you will try a reading for the year, but even if you don’t I wish you a Happy New Year, and I hope that 2016 is your best year ever! I use a couple of pieces to represent healing. 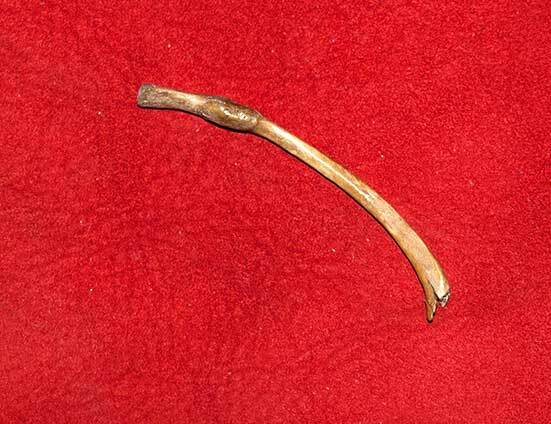 One I touched on in this blog post – the broken and healed Possum rib bone. 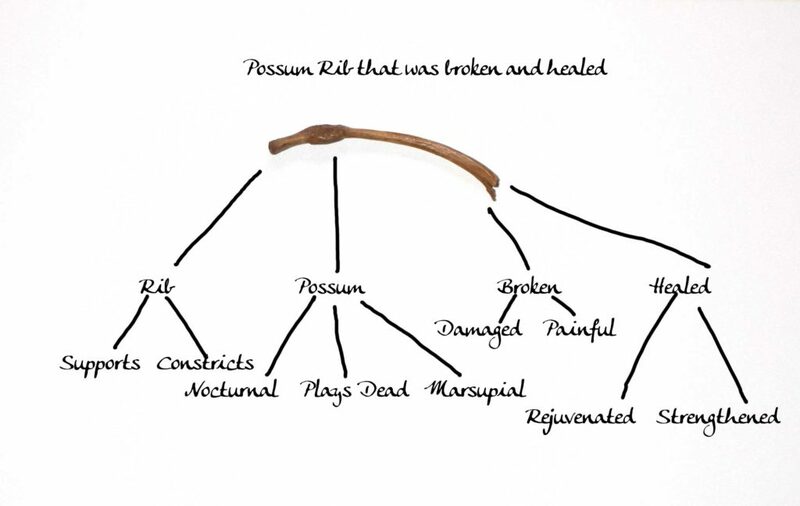 The Possum bone represents a hurt from the past that has already healed. I also have piece that represents ongoing healing – healing that is happening right now. It is a small copper nugget. I grew up seeing, and still occasionally see, advertisements extolling the miraculous healing powers of copper. Copper bracelets for joint pain being the most common. Doing a little research I found that copper is also viewed metaphysically as a healing material. Copper comes in a large variety of forms. 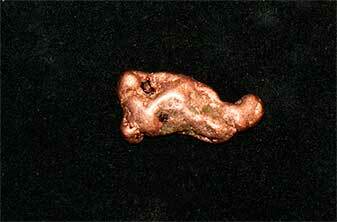 I have seen copper rings, copper thimbles, copper pendants, copper beads, and of course copper nuggets. Any of these pieces would fit nicely in a bone set. The nuggets come in interesting shapes and have a beautiful color and sheen. You might want to stay away from nuggets with rough or pointy protuberances as they might scratch your other pieces. When I see the nugget near the piece that represents the person, it tells me that the person is healing from something. Nearby pieces can provide more information – the heart, the buck eye that I use for health, a coin, or a particular person – often a parent. But even if the copper nugget is not near anything that can shed light on what the healing is about, if it is close to the client piece I know that some type of active healing is taking place within that person. Mentioning it to the client will often elicit the area being healed. Of course there are many things that could be used to represent healing – your grandmother’s nursing pin, a small caduceus, a twig with a knot in it, or anything that symbolizes healing to you. It does not have to be recognizable by anyone else. Many of my clients come to me because they are attempting to work through some type of problem in their lives. When the healing piece is prominent in their reading it often brings a sense of relief or affirmation of what they are already feeling, and what they are trying to achieve. I find it to be a very useful piece in my set. I have a lion’s bone in each of my sets. 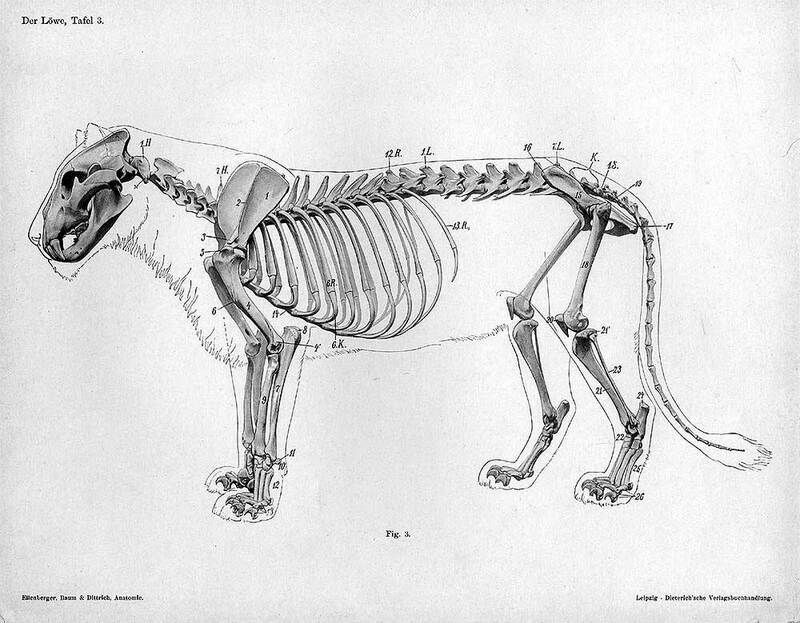 I use this bone to represent the qualities that are generally associated with the lion – courage, pride, and ferocity. All noble qualities, unless taken too far. Then courage can become foolhardiness, and taking unnecessary risks. Pride can get in the way of healing fractured relationships, or prevent us from asking for help when we really need it. And ferocity can be good when we are trying to achieve a goal, but unchecked it can just as easily get in the way of achieving our goals because no one will want to work with us, or patronize our business. There are additional qualities that we associate with the lion like strength, dignity, royalty, and power. Again, they all have a negative aspect as well. When I got my first lion bone it was somewhat round in shape and did not have two clearly distinct faces that were easy to tell apart. I tried marking it so that it would have two faces – one the positive side of its attributes and the other the negative. I used a brown marker to put a mark on it that would look natural. But I never really liked it, or felt comfortable with the marking. Over time it wore down and I finally took a piece of fine grained sand paper and removed the rest of it. Now I rely on pieces nearby to let me know how that leonine energy is playing out, or I just mention the attributes to the client, both good and bad and let them decide for themselves which apply. Of course you don’t have to use an actual bone. The popularity of the lion makes it a frequently used icon, and it can be found on coins, in carvings, and renderings of various sizes, and in jewelry. The lion is a powerful and instantly recognizable symbol in our culture, so much so that you could probably just point to it and say “here is the lion bone,” and the person you are reading for would immediately form some meanings in their own mind. It is one of my favorite bones. You can get lion bones from Lucky Mojo and from The Bone Room. 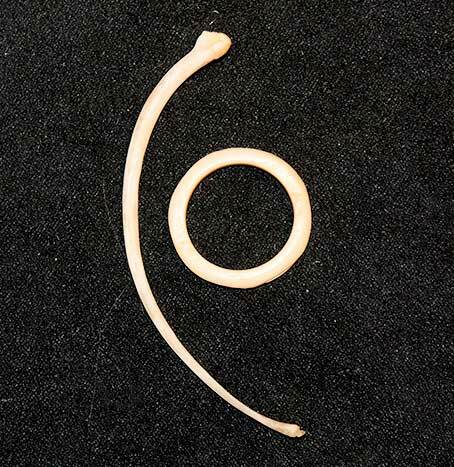 In my set this broken Possum rib represents something in our past that we have healed from. We are complicated creatures and we tend to make things complicated for ourselves. Our minds are full of information and facts about everything we come into contact with, and if we don’t have a lot of information about something we are interested in, we immediately set out to acquire that information. In bone reading this can be both a blessing and a curse. It is wonderful when we have a lot of information about a particular bone or piece. When that bone falls in a key place in a reading all of that knowledge can bring a richness and subtlety to our interpretation of that bone on its own and in relationship to the the pieces around it. That is the blessing of having a lot of information about a particular bone or piece. On the other hand, sometimes having a lot of information about a bone can cause us difficulty. If we have a lot of information and facts about a bone, which facts are pertinent in which cases? This is where simplicity come into play. I recommend that each bone or piece in your set have one primary, simple, one or two words if possible, meaning. That way you always have a clear starting point. From there you can start to apply the other information you know about the piece if it will enhance the client’s understanding, or not. Sometimes providing too much information creates confusion rather than clarity, so it is often best to keep things simple and direct. When we acquire new bones or pieces our minds are often spinning with possible meanings. This is part of the fun of getting new pieces. But once we decide to add that piece to our set we should choose just one simple meaning and push all the other possibilities to the back of our mind. If during a reading you get information from your ancestors, or spirits, or intuition that one of the other possible meanings is more appropriate, by all means go with that. But you don’t want to find yourself looking at a bone during a reading and trying to decide what it means from among a dozen different possibilities that you have floating around in your head because you haven’t pinned down one simple meaning for that piece. I recommend that you start with the simple meaning and if so moved, flesh it out with your additional knowledge. That is much easier than starting with all of your knowledge at the front of your mind and then trying to pull simplicity from the many choices floating around in your head. Just some of the possible directions one can take in coming up with a meaning for this bone. However, all this information can be confusing if you have not settled on one primary meaning for this bone. I have found a domino to be a useful piece in my bone sets. The domino can have the numbered side showing or the blank side showing. If the numbered side is showing, I interpret that as the client is aware of the situation. They have a good idea of just what is going on, or just what the problem is. If the blank, or back side is showing the client is likely in the dark. There is something they don’t know about the current situation and they may not have enough knowledge to take rational action. Other pieces can shed additional light on this. If the domino is face/numbered side up, I look for further confirmation in the cat’s eye shell. If it is showing the eye, the client is going in with their eyes open. If it is face down while the domino is face up, the client knows what is going on, but there may be something that they are not seeing. I then look for the mask which indicates a secret. If it is face up the reason the client can’t see may be that someone is hiding, or withholding something. If the mask is face down the client is not seeing for some other reason. Location is important too. If the mask is face up on the far reaches of the cloth, far removed from the action so to speak, the secret may not be very important. If it is near a person piece, it could be indicating who the secret keeper is. Likewise, if the cat’s eye shell is far away on the edges of the reading, whatever you are missing may not be very important. 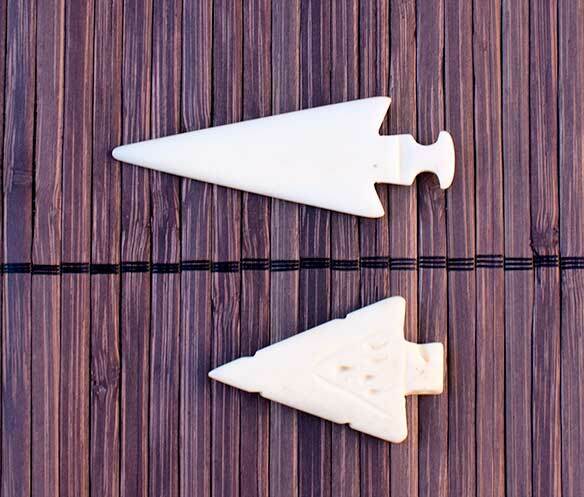 A mahjong piece is similarly sized and shaped and could serve the same purpose. I’m not going to explain the whole thing again with the domino face down – I’m sure you get the idea. You could also choose a domino with numbers that were meaningful for you and incorporate those numbers into your reading as well. Perhaps a piece landing on or touching a certain number could have a particular meaning for you. Another way to use the domino is to use it to represent the client his or herself. Again, its being double sided provides the additional information of whether the client is aware or not, participating or not, interested or not, etc. 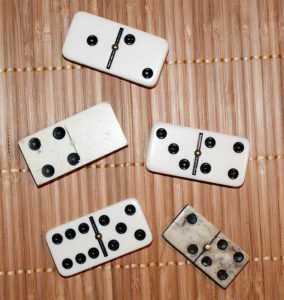 While I have a separate client piece, there is no reason why the domino could not be used this way, especially if you are trying to keep the number of pieces in your set smaller. Of course you don’t have to have a domino – you could use anything that has two sides to represent the client’s awareness about the issue. 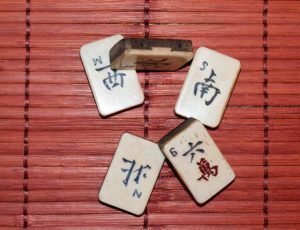 I have been seeing antique Mahjong pieces at the jewelry and bead shows recently and they could serve the same purpose. You could also decide that you don’t need this piece at all. It’s not vital for a reading – it’s more of a “nice to have” piece in my mind. I find it useful, but try it for yourself and see if it adds anything to your readings. I have found that pointers and/or separators can be useful in bone reading. 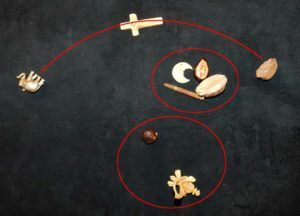 An arrow or something similar pointing at a bone or group of bones sends a strong visual message – all but screaming “pay attention here, this is important!” Likewise separators can help your readings by giving a clear message that “this issue is separate from that.” You can use a number of items to represent these concepts. An actual arrow is the most obvious choice and when I started reading a had a small brass arrow. However, it quickly became apparent that it was too small to work well with my shells. It frequently ended up inside of a shell no matter how small the opening. 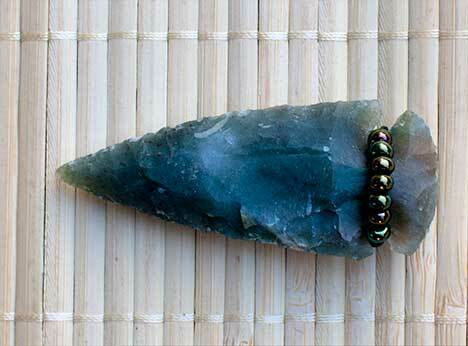 I replaced it with a stone arrowhead. 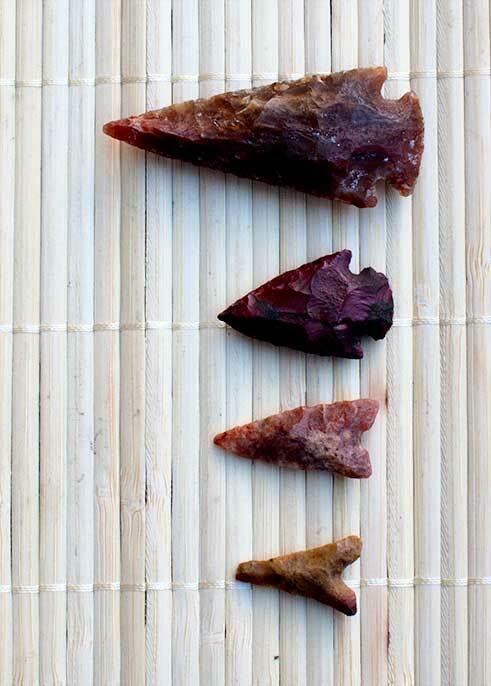 You can get these rather inexpensively if they are of modern manufacture and for a bit more you can have an antique arrowhead. 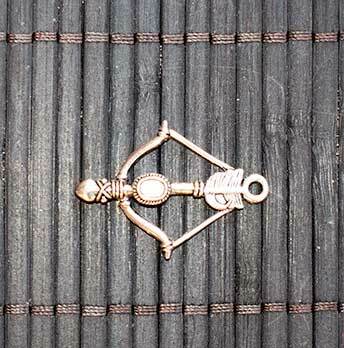 Eventually I replaced the arrow with a small gemstone maintaining the idea, but changing the representation of it. I learned of separators from one of my teachers* who used sea anemone spines for this purpose and I adopted that practice as well. I have four in my main set and two in my travel set. Both sets have a rather large number of pieces and I find that them very helpful in delineating issues. 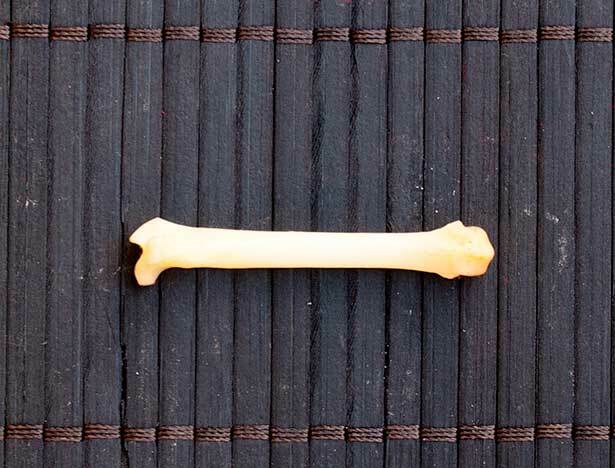 If you have a small number of bones one pointer/separator might be plenty. Long, slender crystals could be used as well and they have the additional benefit of catching the light making them easy to see. You could even use a bone for this purpose. There are lots of long, slender bones available and some have easily differentiated ends which can add another level of meaning. 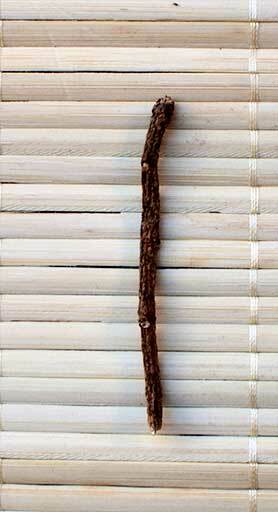 A twig is another possibility and they are available in abundance. You might even choose a specific wood or shrub to add additional meaning. 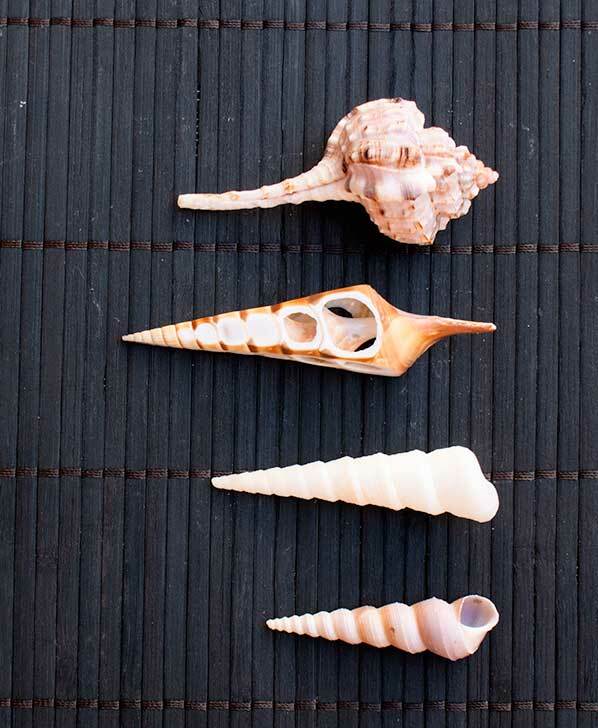 And of course there are seashells that are suited to this purpose as well. You might want to try using pointers and/or separators. Not everyone will find them useful, and for a small set they may be more of a distraction than a help, but for larger sets especially they are worthy of a try.